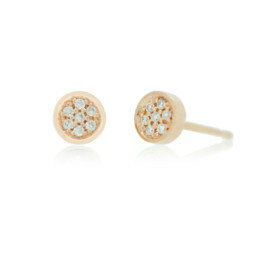 Micropave set diamond earrings in hand-alloyed 18k rose Fairtrade gold. Origin Australia® diamonds responsibly sourced from the Argyle mine. Diameter of earrings approximately 5mm across. A perfect match to the double row micropave eternity ring .